When you turn on your Samsung Galaxy S8the first time, it will ask you a series of ten questions and preferences to configure it. The good folks at Samsung are well-intentioned, but not every customer who owns a Samsung Galaxy S8 knows, from day one, whether he or she wants a Samsung account, what’s a good name for the phone, or what the purpose of a cloud service, such as Dropbox, is and how it would be used. You can relax. This article helps answer these questions. On the other hand, if your phone is already set up, you probably took a guess or skipped some questions. Maybe now you’re rethinking some of your choices. No problem. You can go back and change any answer you gave and get your phone to behave the way you want. Language/Accessibility: This option lets you select your language. The default is English for phones sold within the United States. Also, the phone has some special capabilities for individuals with disabilities. If you have a disability and think you might benefit, take a look at these options. They have really tried to make this phone as usable as possible for as many folks as possible. Wi-Fi: Your phone automatically starts scanning for a Wi-Fi connection. You can always use the cellular connection when you are in cellular coverage, but if there is a Wi-Fi connection available, your phone will try to use this first. It is probably cheaper and may be faster than the cellular. At the same time, you may not want your phone to connect to the Wi-Fi access point with the best signal. It could be that the strongest signal is a fee-based service, whereas the next best signal is free. In any case, this page scans the available options and presents them to you. Date and Time: This is easy. The default setting is to use the time and date that comes from the cellular network and the date and time format is the U.S. style. Just tap on the next button and move on. This date and time from the cellular network is the most accurate information you’ll get, and you don’t need to do anything other than be within cellular coverage now and again. If you prefer non-U.S. formatting, such as a 24-hour clock or day/month/year formatting, you can change your phone any way you want. Sign up for a Samsung Account: Go ahead and sign up for an account. The Samsung account offers you some nice things to help you get your phone back should you lose it. All you need is an account name, such as an email account, and a password. When you buy a Galaxy S8 smartphone, you are now a customer of multiple companies! These include Samsung for the phone hardware, Google for the phone operating system (Android), and the wireless carrier that provides the cellular service. Plus, if you bought the phone through a phone retailer, such as Best Buy, it is in the mix as well. All of them want to make you happy, which is a good thing for the most part. The only downside is that they want to know who you are so that they can provide you with more services. Don’t worry. You control how much they offer you. Google Account Sign-up:Google account means an email account where the address ends in @gmail.com. If you already have an account on Gmail, enter your user ID and password here. If you don’t have a Gmail account, it’s recommended that you create a Gmail account, but there are some considerations on selecting a good name. If you are game, pick a name for your Gmail account now. Location Options: Your phone knowing your location and providing it to an application can be sensitive issue. If you’re really worried about privacy and security, tap the green check marks on the screen and then tap the button that says Next. Selecting these options prevents applications from knowing where you are. (This choice also prevents you from getting directions and a large number of cool capabilities that are built into applications.) The only folks who’ll know your location will be the 911 dispatchers if you dial them. If you’re worried about your security but want to take advantage of some of the cool capabilities built into your phone, tap the right arrow key to move forward. Remember, you can choose on a case-by-case basis whether to share your location. Phone Ownership: This screen asks you to enter your first and last name. Go ahead and put in your real name. Cloud Services: The chances are that you will be offered the option to sign up for a cloud service where you can back up your phone and get access to a gazillion MB of free storage. This can be a tricky decision. You could sign up for every cloud service that comes along. Then you need to remember where you stored that critical file. You could sign up for one, and you may miss a nice capability that is available on another. You could have one cloud service for work and another for personal. Here is what I recommend: Sign up for whatever is the cloud service your phone offers during this initial setup process if you do not already have one. You will see what it is later. If you are happy with a cloud service you already have, such as Dropbox or OneDrive, chances are, they will have all the services you need for you and your phone. You can link your Galaxy S8 to this service by downloading the necessary app. Learn about Key Features: If you think you don’t need this book, go ahead and take this tour of all the new things you can do. If you think you might need this book in any way, shape, or form, tap the Next button. This screen is for setting up the coolest and the most sophisticated capabilities of the phone. Device Name: When this screen comes up, you’ll see a text box that has the model name. You can keep this name for your phone, or you can choose to personalize it a bit. 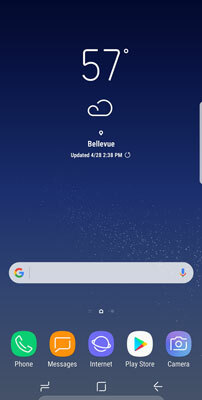 For example, you can change it to “Bill’s Galaxy S8” or “Indy at 425-555-1234.” The purpose of this name is for connecting to a local data network, as when you’re pairing to a Bluetooth device. If this last sentence made no sense to you, don’t worry about it. Tap Finish. In a moment, you see the Home screen, as shown. The Home screen for the Samsung Galaxy S8.